The ATM Industry Association (ATMIA) is an independent, non-profit trade association, engaged in the non-competitive promotion of the ATM industry. The European Security Transport Association (ESTA) is a non-profit association which was established in Brussels in 1975. 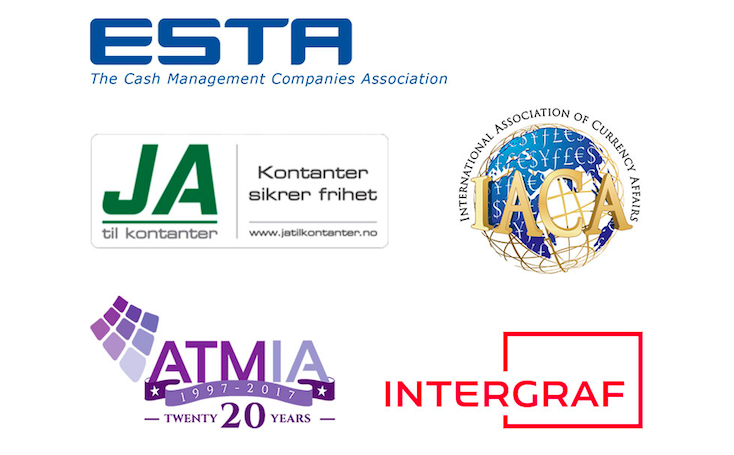 ESTA represents the common interests of secure logistics throughout Europe and 90% of the European Cash Management Companies. EURICPA represents the leading European manufacturers of intelligent solutions for secure cash transportation and storage. The Brussels-based association covers the full range of secure cash transportation in European Markets, using neutralisation technologies with indelible dye, Europe’s best laboratory for homologation tests and solutions or services providers for securing valuables and cash-in-transit areas (educational institutions, governments, non-profit organisations, etc.). 'Intergraf is a non-profit association based in Brussels representing the interests of the printing and security printing industries across Europe. As part of its mission to ensure that the voice of 22 national printing federations in 20 countries is heard, Intergraf provides targeted services to the global security printing community. 'Intergraf organises Security Printers: the only independently funded, neutral platform for discussing pressing issues in the banknote and identity world today, attended by customers, printers and suppliers alike since 1976. The International Association of Currency Affairs (IACA) works with the public and private sector to provide for an international exchange for consultation and collaboration on matters of interest to stakeholders in the cash payments cycle. Ja Til Kontanter is a formal interest organisation with the goal of defending cash in Norway's payments landscape by getting as many members as the SV party. It was established in 2016, the purpose has remained unchanged: to preserve the king's coin. Cash Matters is funded by the International Currency Association.